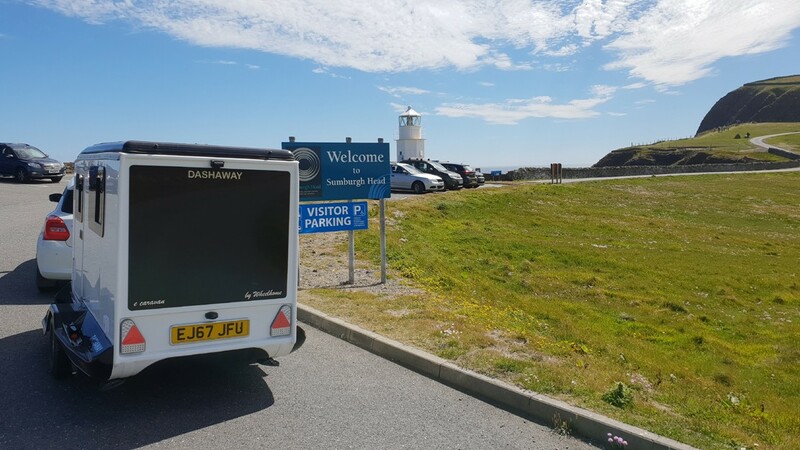 Dashaway performed faultlessly, with solar panel re-charging the on-board auxiliary batteries so well (in good weather) that a re-charge from campsite hook up was only required once in the two week period. 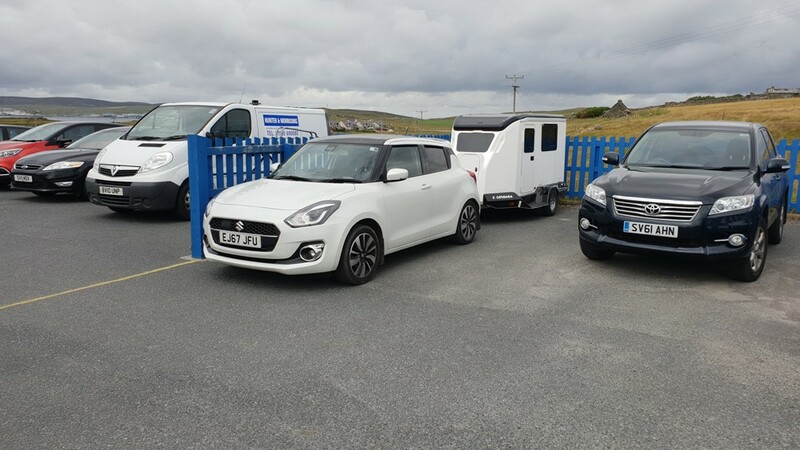 Tow car was a Suzuki Swift with 1 litre petrol engine and automatic transmission. 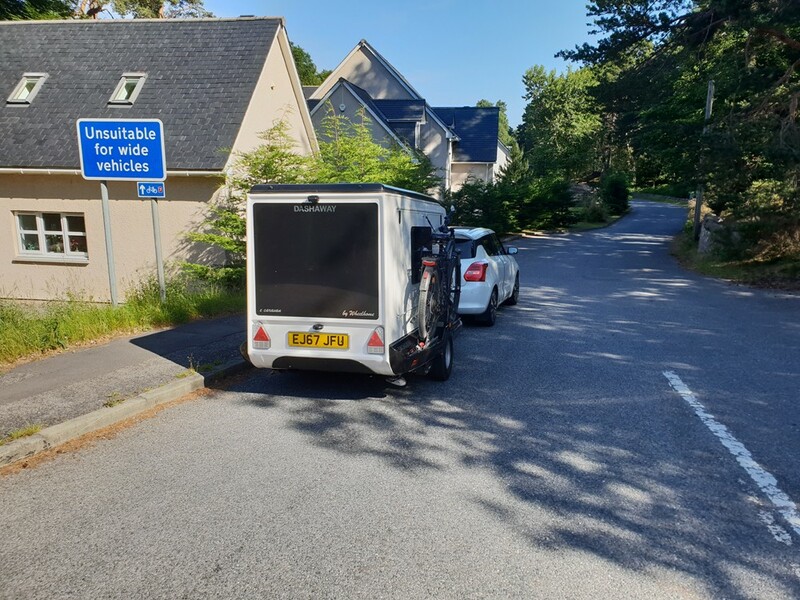 It towed extremely well being very stable and returned over 35mpg to Aviemore and then Aberdeen, carrying an electric bike. 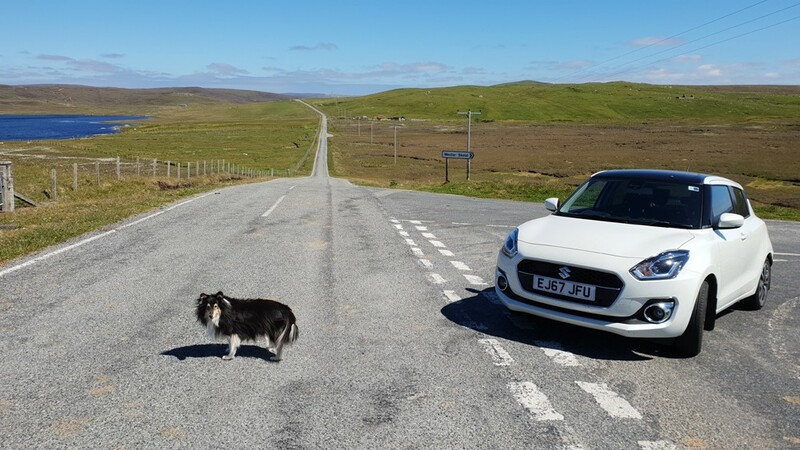 Shetland reduced that though, to an overall 33 mpg for the whole 2,000 mile round trip from Essex. Ferry info. Contact Northlink Ferries. 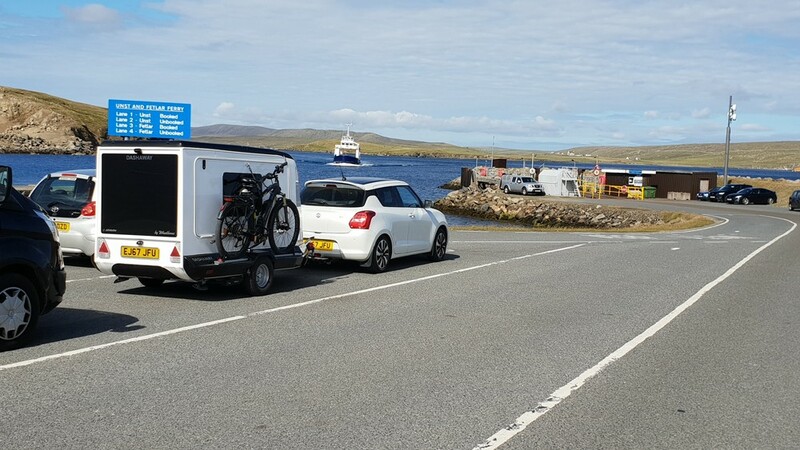 Cost of normally 12 hour ferry from Aberdeen to Lerwick for car, Dashaway and cabin £560 approx. Could be cheaper if prepared to sleep on a “couchette” (reclining seat), I wasn’t! 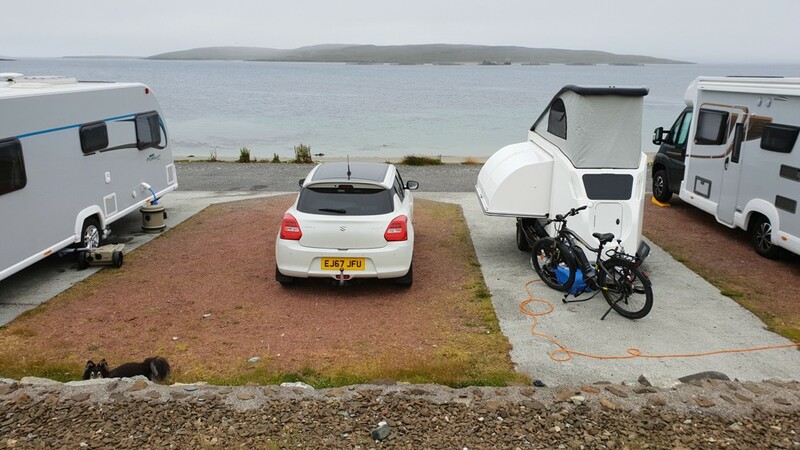 Cost of campsites typically £18 night with electric hook up. 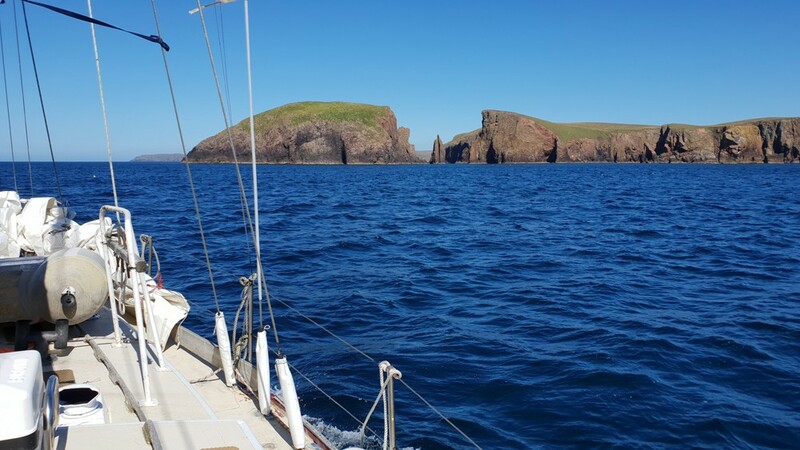 Dashaway to: Shetland! ("No ordinary holiday"). This report is dedicated to Tara, “The Wheelhome dog”, who sadly passed away just a few months after this trip. 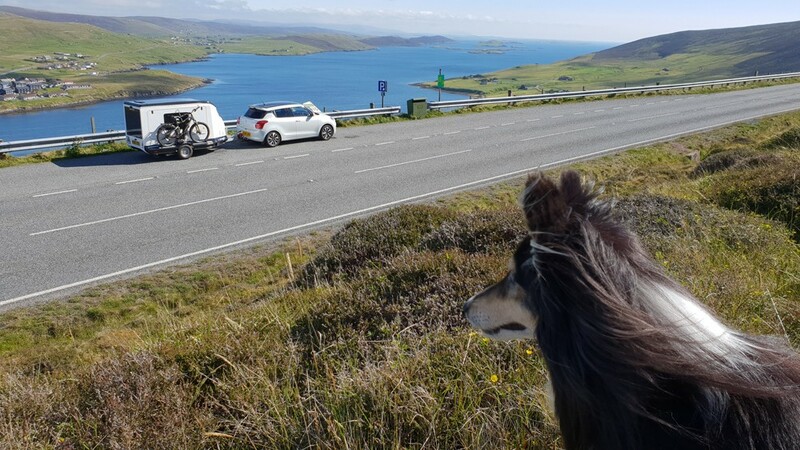 Shetland was to be a rather fitting last adventure for her. 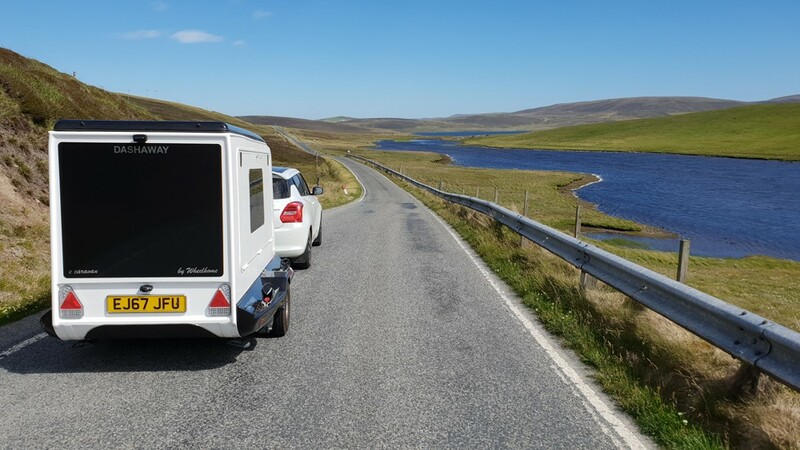 June/July 2018, Stephen Wheeler (and his Sheltie collie, Tara) of Wheelhome took the ground-breaking new and exciting all electric Dashaway e caravan to the stunning Shetland Isles. Heavy rain and strong winds were expected. However, blue sky was the order of the day, and a whole lot more besides, as this turned out to be a genuine adventure with terrible tragedy involving a full-scale air and sea search, helping police Scotland "with their enquiries" Tara being filmed and the Dashaway being the catalyst to the extraordinary warmth and hospitality of the Shetland Islanders. Stephen's account is told alongside the photographs. It will take a little while to go through, so, get yourself a nice drink, make yourself comfy, and immerse yourself in the adventure! 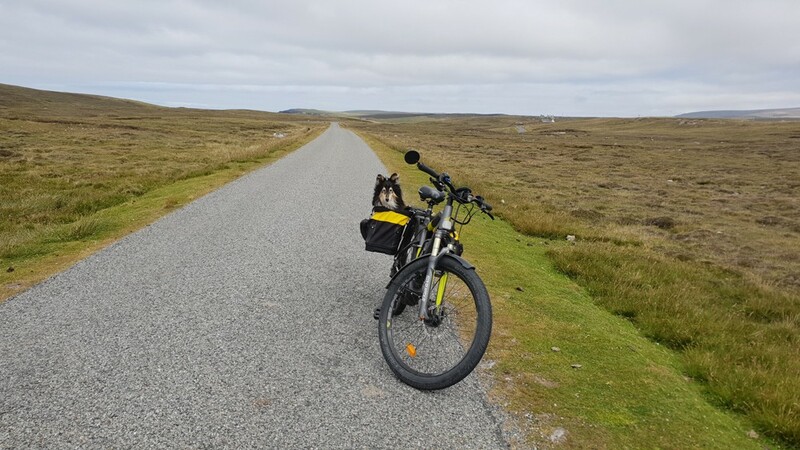 We hope you enjoy the journey and maybe even contemplate a trip of your own to Shetland (or Sheltieland as Stephen calls it). 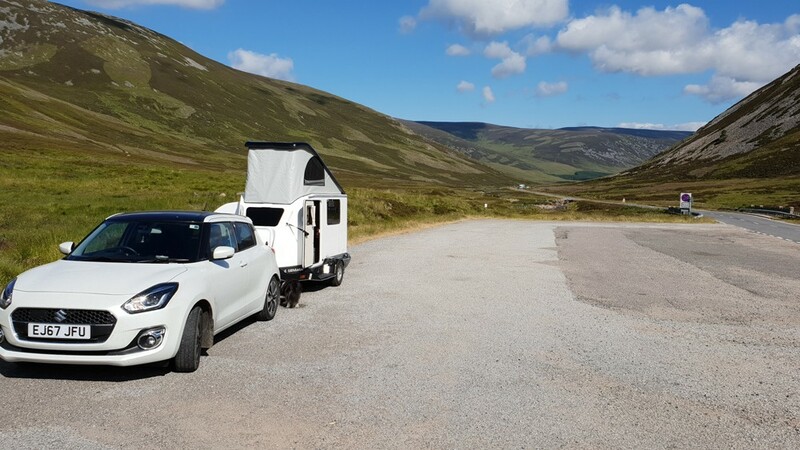 We spent three days at Rothiemurchus Camp and Caravan Park, Aviemore. 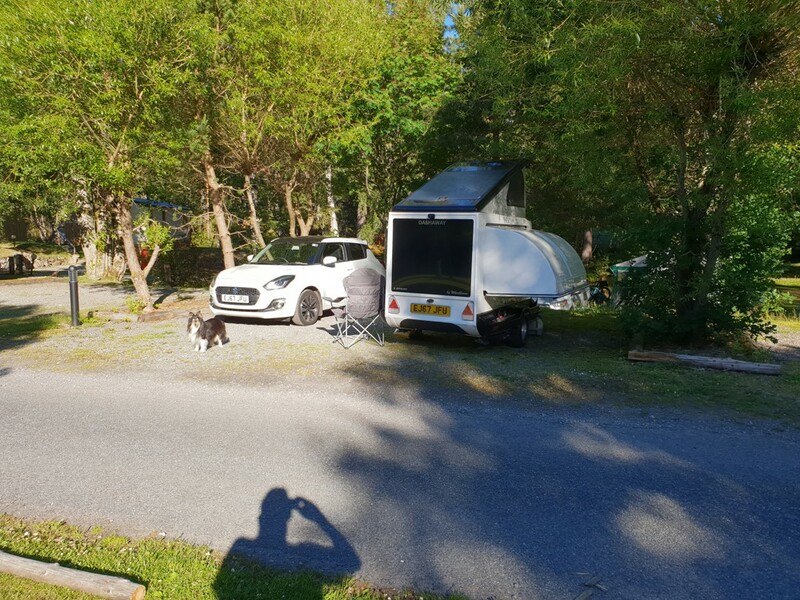 Our allocated pitch was almost totally in the shade from the relentless sun due to the trees around its perimeter, so very little charge from solar then! 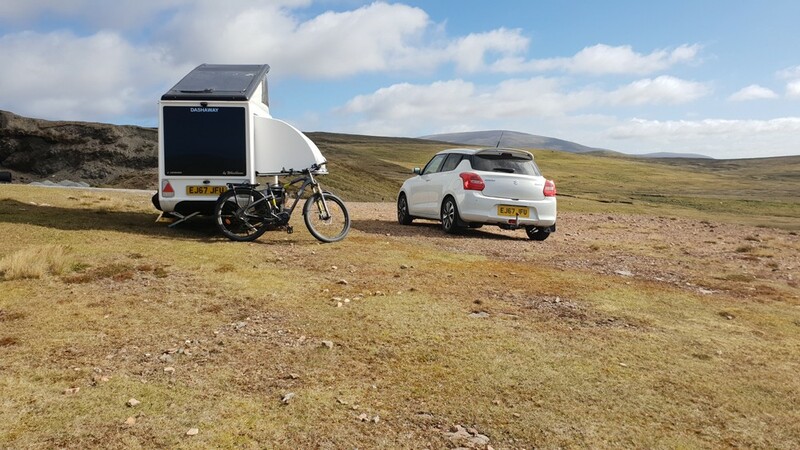 However, with the optional additional battery and only minimal support from the solar panel the batteries lasted the 3 days, that was for all the cooking and even recharging my electric bike! 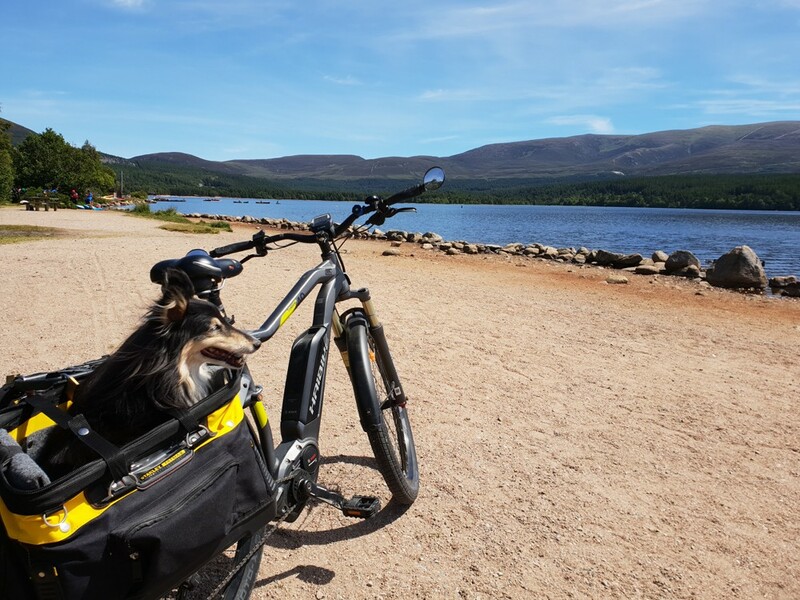 From Aviemore, an easy day's (electric) cycle ride to Cairngorm took us via this superb lake, with proper golden sand! Used in WWII for bombing practice! Cairngorm Ski Centre car park. 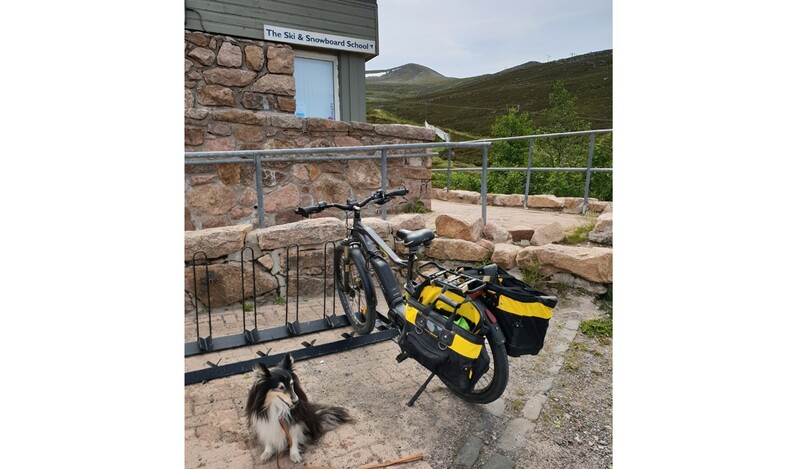 Tara received lots of attention from coach travellers from Liverpool and centre staff, one of whom took her photo whilst sitting in her bike pannier, it went "live" on Cairngorm's facebook page that evening! Would she "go viral", I wondered! We travelled across to Aberdeen in wonderful sunny weather, having set off at Ken (dot) Bruce o'clock, just as a little bushy-tailed red squirrel ran across the quiet narrow road as we passed a sign that said "unsuitable for wide vehicles". We proceeded confidently and with a hint of smugness though, safe in the knowledge the little Dashaway was no wider than the car. Towie... The Only Way Is Essex! 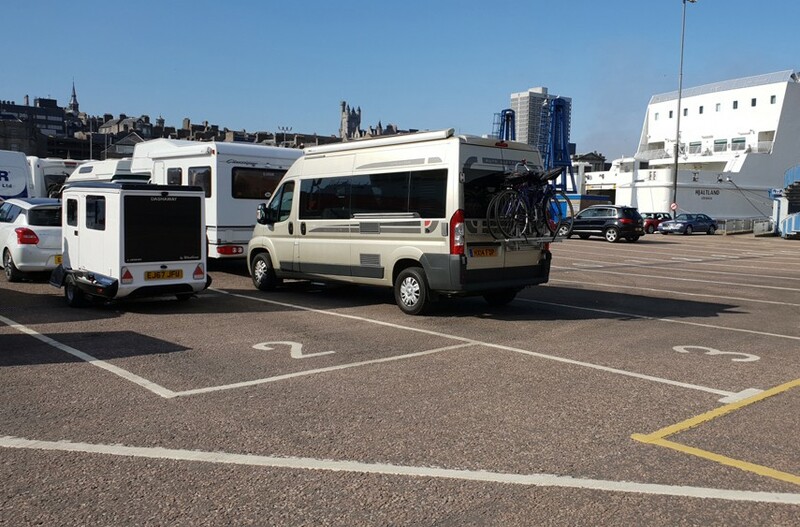 Arriving a few hours early at Aberdeen we went up the coast a little for a long walk, before a long voyage, and had a brew using the Dashaway's all-electric cooking facilities! 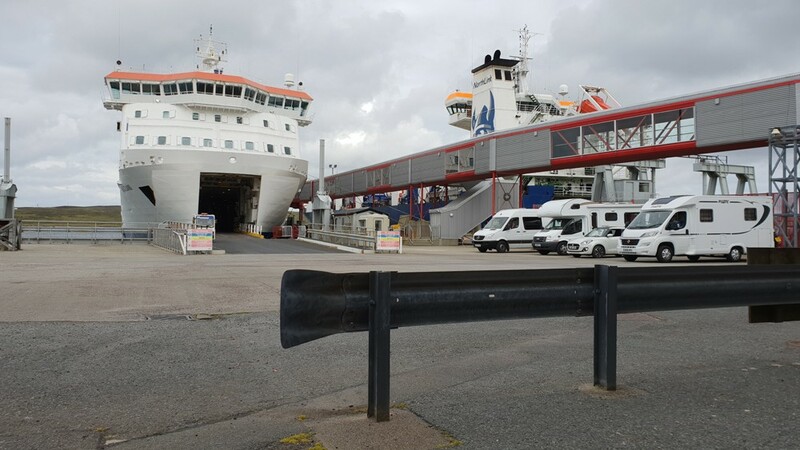 Waiting to board Northlink ferries MV Hjaltland at Aberdeen...it seems our presence did not go un-noted! At the check in I had to hold Tara (my Shetland sheepdog) up on my lap so the check in girl could make a fuss of her (apologies to those behind!). Its so refreshing to be made this welcome with a dog, something that was replicated at cafes too where they sometimes even put ice in her (free) dog bowl of water. That's friendly. Very well done Scotland/Shetland. They strap 'em down on MV Hjaltland, although we actually had calm weather. The Northlink ferries crew were all very smart, courteous and obliging: A couple of hours into the voyage a security officer escorted myself and two other concerned dog owners down to the kennels/car deck, so we could exercise our pooches back up top, outside on deck 5, for a little time. I wonder if they realise just how much that meant to me (us). Tara was overjoyed and happily received pats and strokes from fellow travellers, who seemed amused! I took photos of Tara and throughout the evening, which were later of interest to the police. 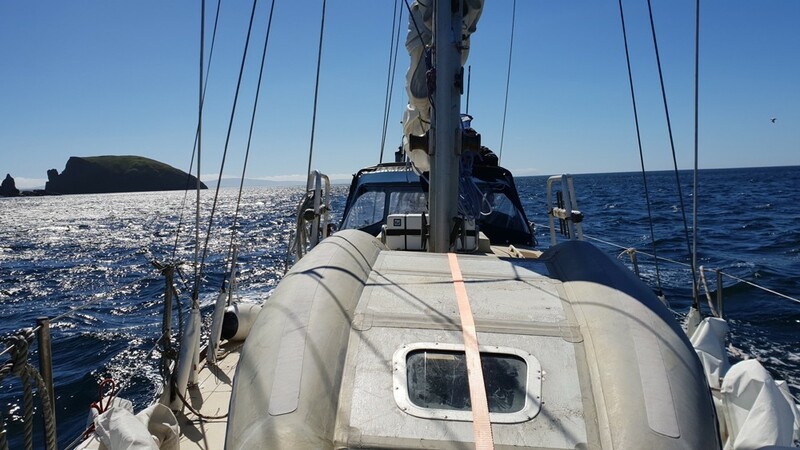 My cabin onboard the MV Hjaltland (pronounced yateland, norse for Shetland I believe) was fine, better than expected to be honest, en-suite shower, powerful and plentiful. Clean too. However, I didn't get to use it much. At 23.30hrs, the captain made the sort of announcement neither he, nor us passengers ever expect to hear; A crew member was unaccounted for, the ship having been searched to no avail, the captain declared this was now "a man overboard situation" and requested the assistance of any willing passengers to keep lookout, outside on rear deck 5, where I'd exercised Tara earlier that evening. Coat and warm clothes donned, I went out with appropriate urgency as did other passengers and crew. A Mayday had been sent out. The sea was calm, there was a full moon but frequently foggy. 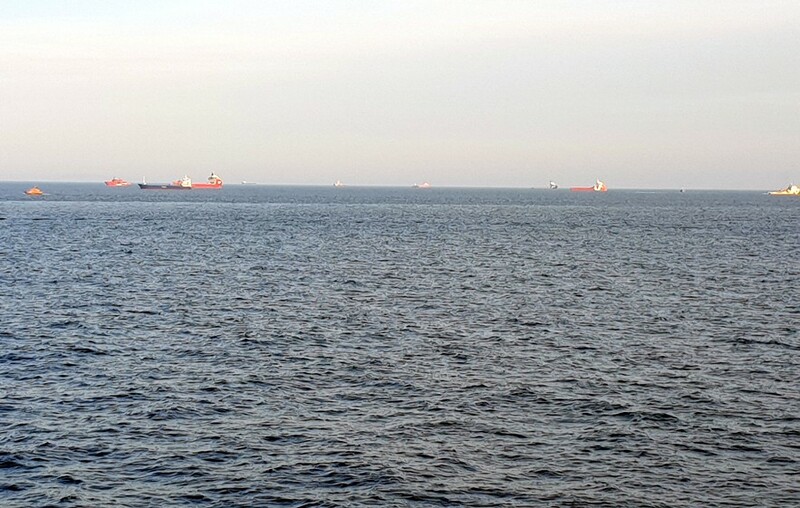 I counted 14 other ships in-line abreast of us, including a lifeboat. 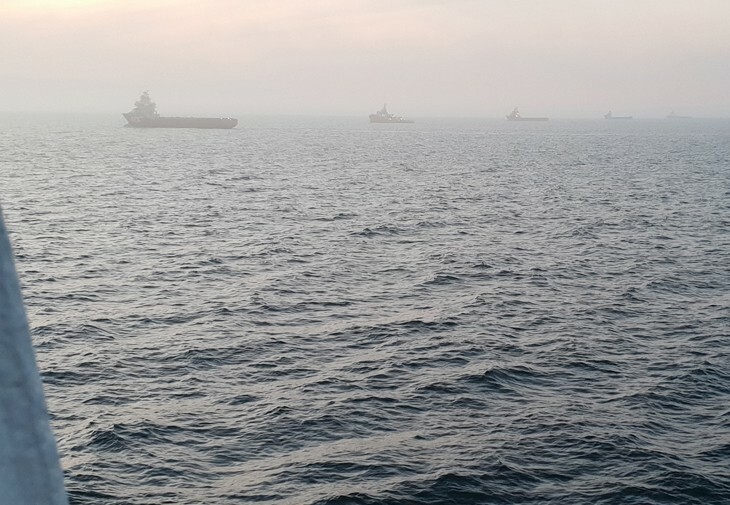 However, I'm told this was a major search and rescue operation that went on all through the night, involving over 25 ships, 3 lifeboats and a helicopter, sadly, in vain. 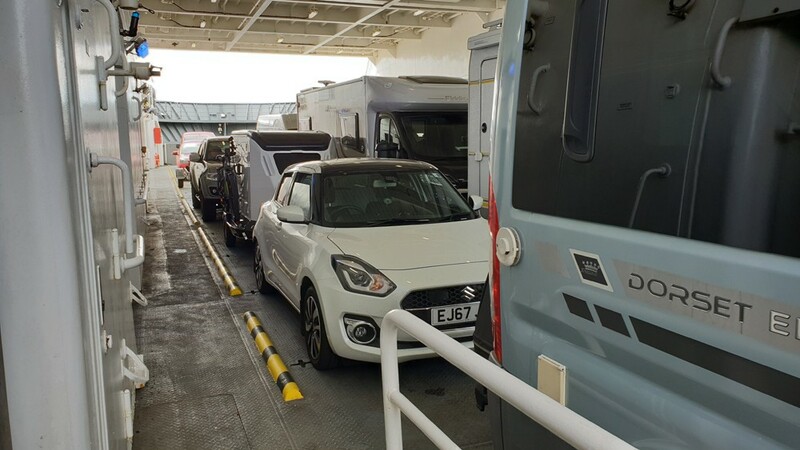 It was truly terrible, and yet some good came from it as conversations were struck with other passengers including a lady who lived on Shetland and had noticed the Dashaway earlier, prior to boarding. Little did I know, but that tragic night effected my whole time on Shetland, in a positive way. 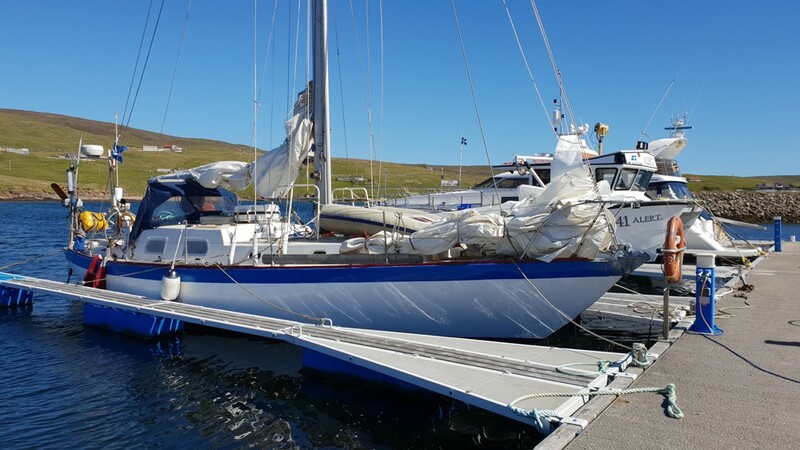 We eventually docked at Lerwick, Shetland, at 12:30hrs, some 5 hours later than scheduled. This meant the 12.5 hour voyage became a 17.5 hour voyage. 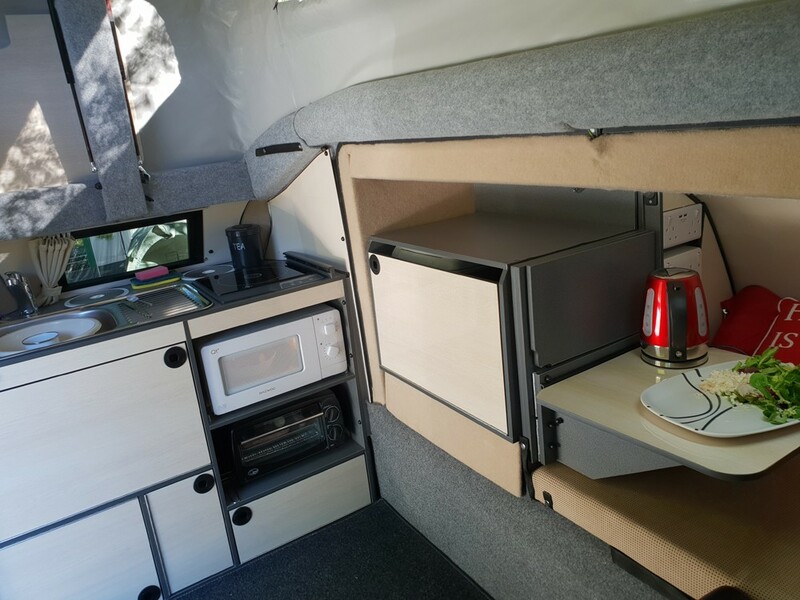 This would have been disastrous for a camper/caravan with a "typical" 3-way fridge as it would have warmed up considerably in that time, as you can't run it on gas of course "at sea". Not so the Dashaway, as it has a compressor fridge which runs efficiently from the auxiliary battery supplied 12volts only, so preserved everything perfectly. It's really so simple to use as you don't have to adjust the fridge controls once you leave home, it's that easy. We were all now part of a missing person enquiry and had to fill in a police questionnaire. Our I.D. 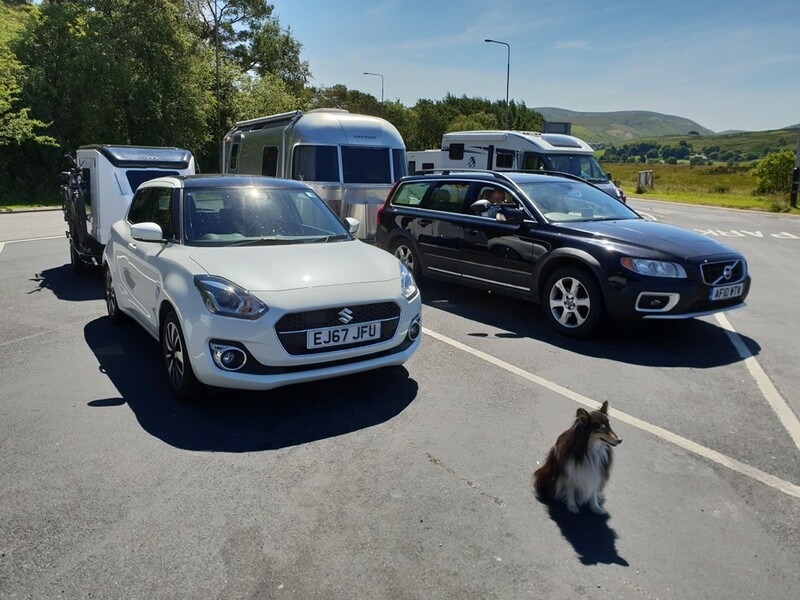 and vehicles were checked over by the friendly and courteous police officers as we disembarked, with the Dashaway drawing particular attention. 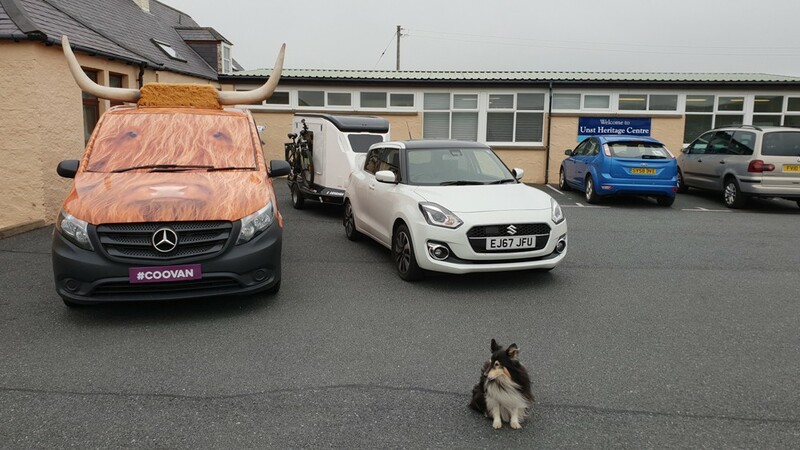 It was a rather surreal start to our arrival on Shetland. 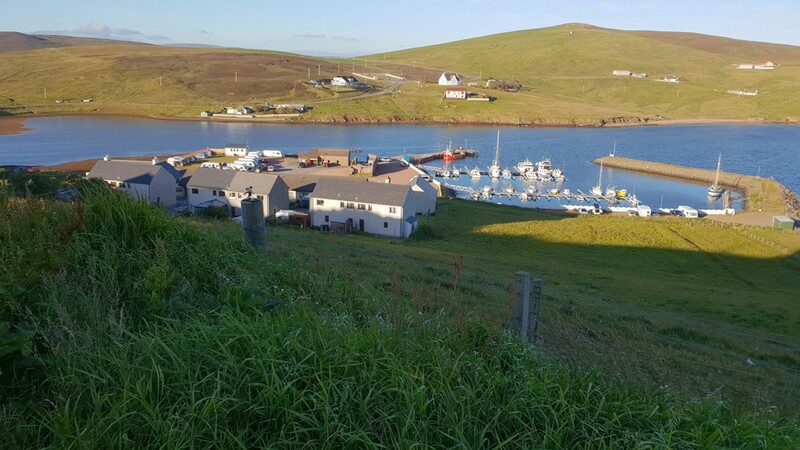 Blue sky, blue sea, beautiful Shetland voe. 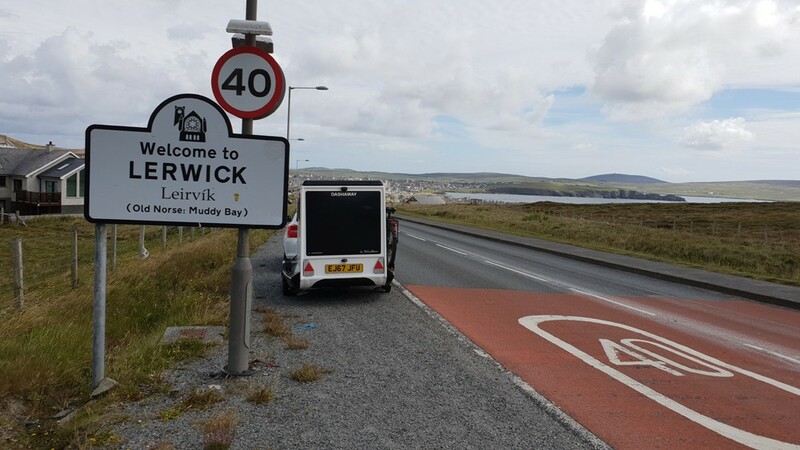 Towards the end of my first day on Shetland I received a phone call from the police requesting I returned to Lerwick as they were interested in the photos I'd taken on the ferry coming to Lerwick. 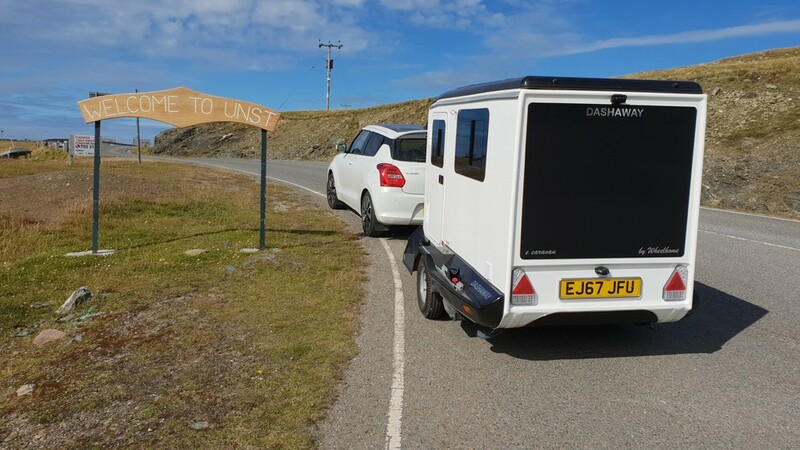 I was just 20 mins from a campsite (Skeld) where I could have dropped off the Dashaway, but they, politely, requested I returned forthwith! 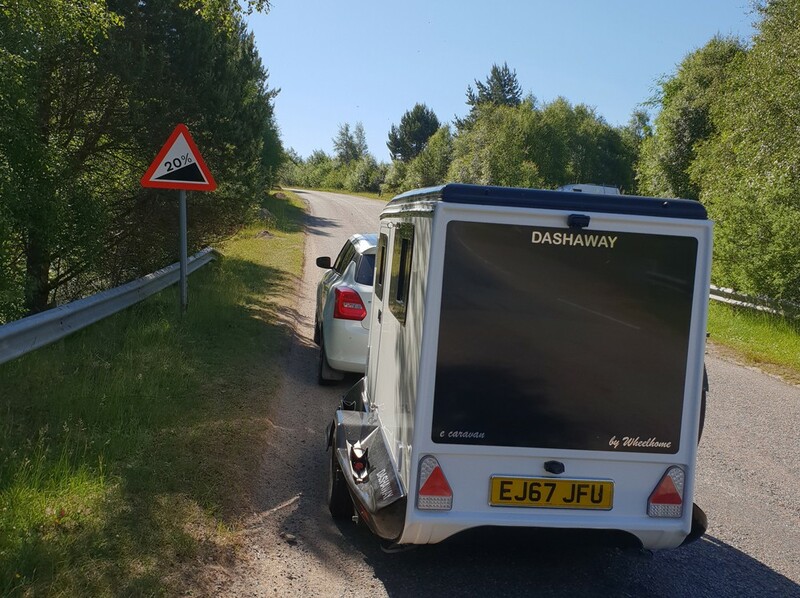 So, an about-turn in the road with Dashaway on the back was called for! They took copies of some photos, accompanied by a statement. 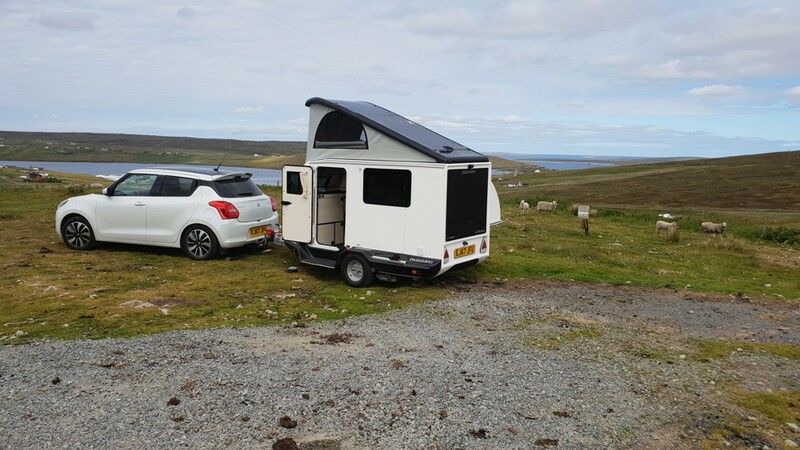 You will find the Skeld caravan site on the western side of Shetland, run by Josephine and Nadia. Be aware though, the nearest grocery shop (and petrol) is about 8 miles away at Bixter. On the plus side, you're treated to the most gorgeous views with the quietest roads getting there. It is right beside a picturesque little marina. No TV, no DAB radio, but did have WiFi and phone signal, if you went up the near-by hill! Peace and quiet in bucket loads! On returning to the Dashaway on my second day I found a handwritten note had been left for me, Oh dear I thought, am I in the wrong place? have I got to move? But no, it was from a lady I'd chatted to on the ferry "that night". 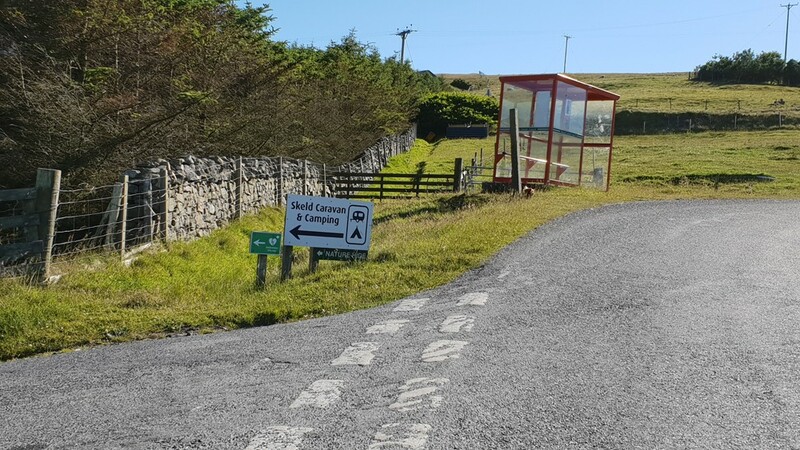 There are over 22,000 people on Shetland, and yet I had camped within sight of where she lived! 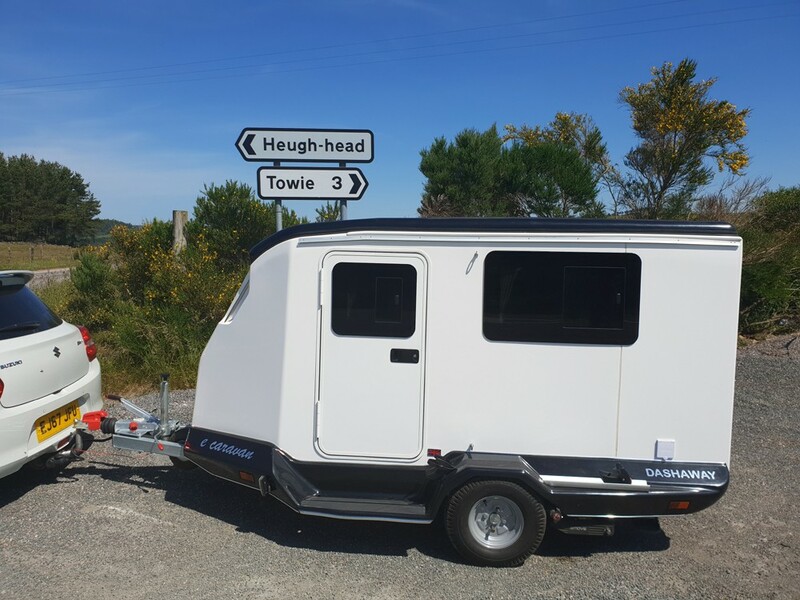 The note said she and her husband would love to see the Dashaway e caravan, but before that, come for dinner with them tonight! So I did, and I was to take Tara too. 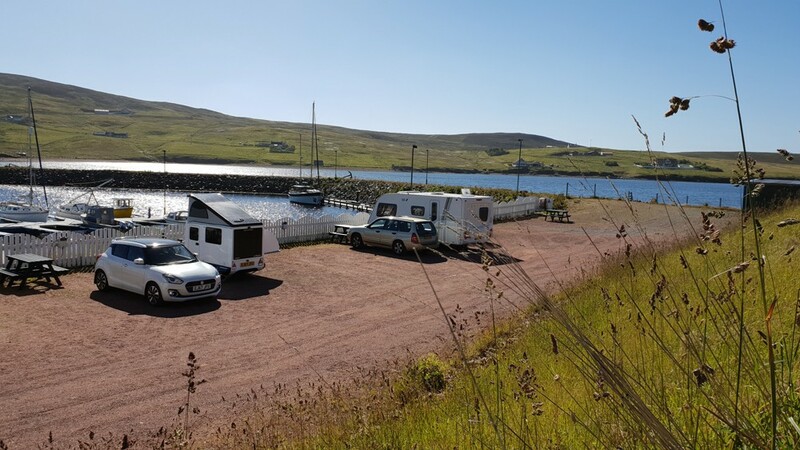 My new Shetland friends made me incredibly welcome and we had a wonderful evening, culminating with "him" charging around the campsite on my electric bike, and then inviting me out on his beautiful yacht the next day! I couldn't refuse! The Shetland coastline is simply stunning. 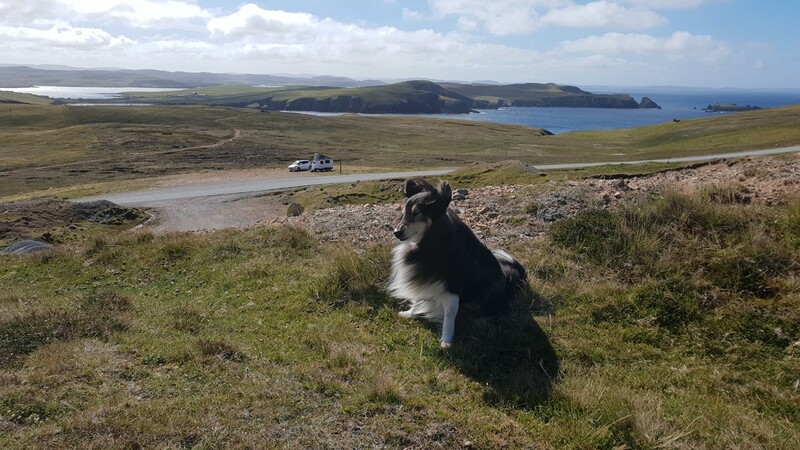 On the way to the deep south, Sumburgh, I stopped off at the very smart Mackenzie's farm shop and cafe, where I sat outside with my Sheltie dog Tara, eating wonderful fresh food and admiring the wonderful sea views. 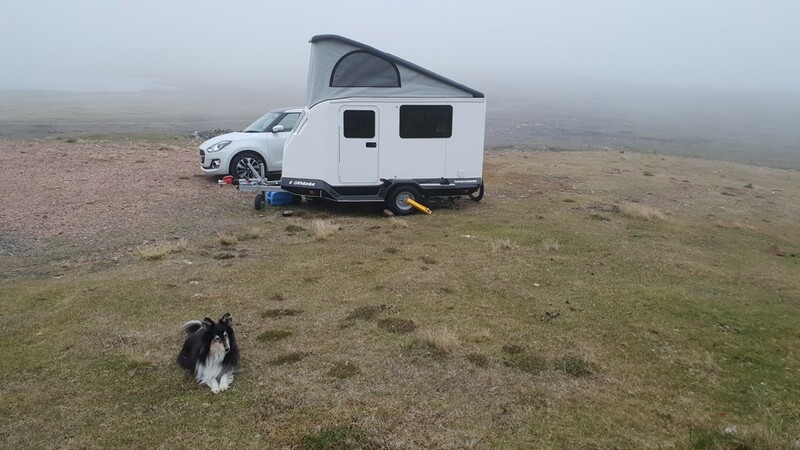 I was approached by folk with a VW camper who'd heard I was "up here testing" and "in the business". They had a problem with their rock-and-roll bed and asked if I'd "take a look". I duly obliged of course. 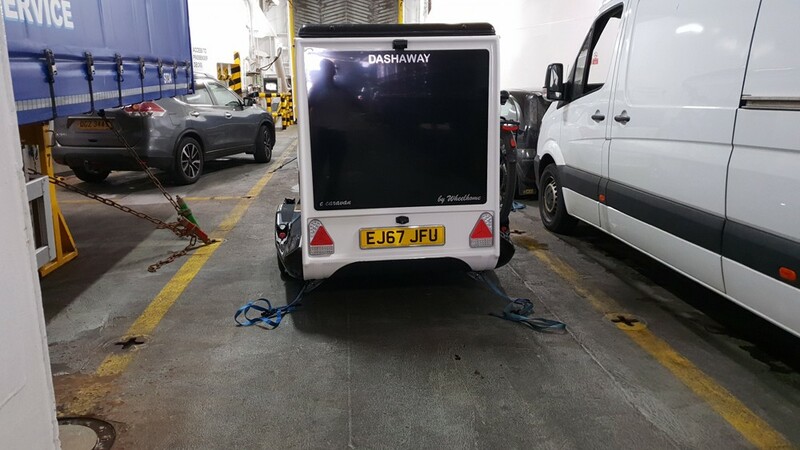 Seems they'd seen me, well Dashaway, on the ferry. 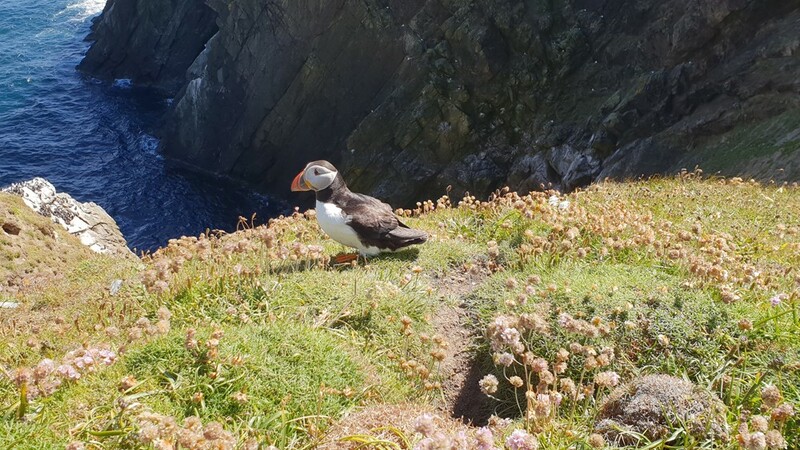 Sumburgh Head, as far south as you can go - and you'll see Puffins here! Puffins! Hardy little chaps they are too! We got within 5' of them. No Congestion Charge here! Roads are mostly single track with plentiful passing places, don't forget to wave a thank you when the other driver pulls in for you. Curiously, after a while, you find yourself waving even when YOU have given way! Everyone is just so friendly. They are very good quality and not potholed. 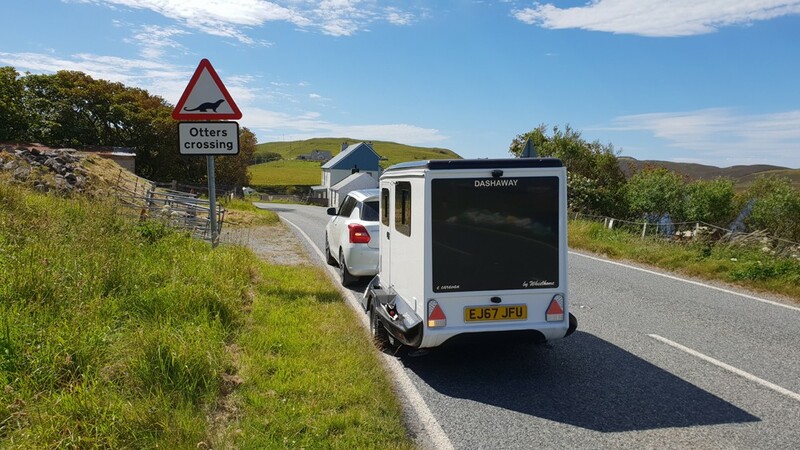 Otters crossing! Don't see that in Essex! Watch out! Three "Shelties". 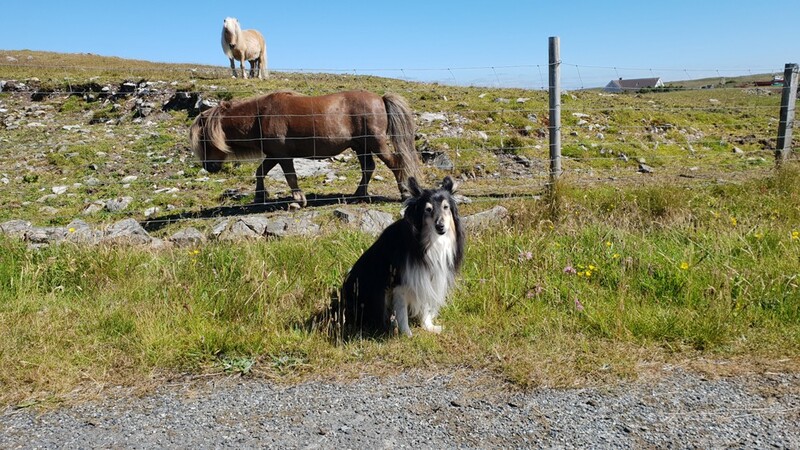 The Unst Heritage Centre informed me that Shetland ponies are sometimes called "Shelties" as well as Shetland sheep dogs (like my Tara). A pleasure to travel along. 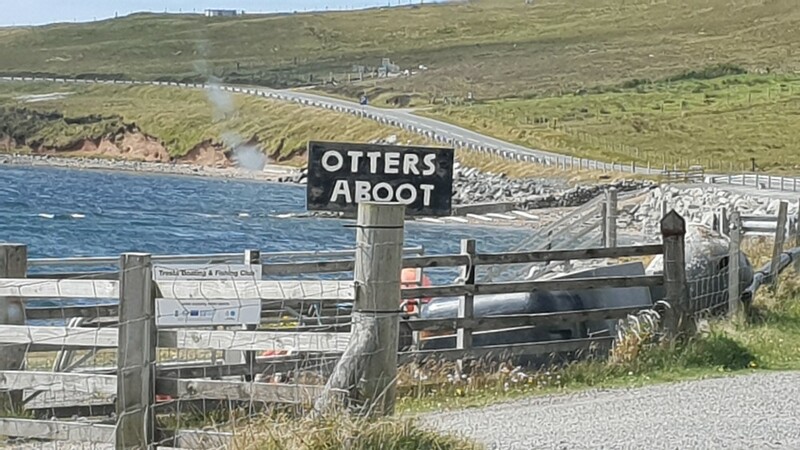 (my favourite photo of Shetland). 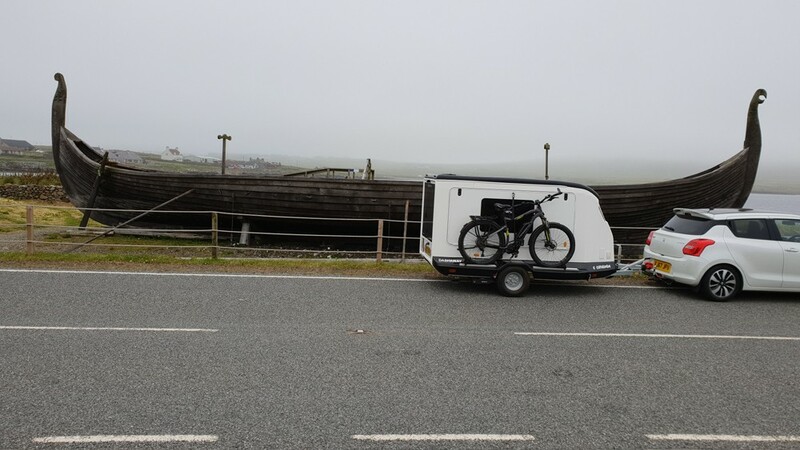 Waiting to catch ferry from Yell to Unst. Unst, the most northerly inhabited island of the archipelago. Stopped for lunch. Sheep initially scattered but slowly returned as I sat quietly, with my little sheep dog at my side! 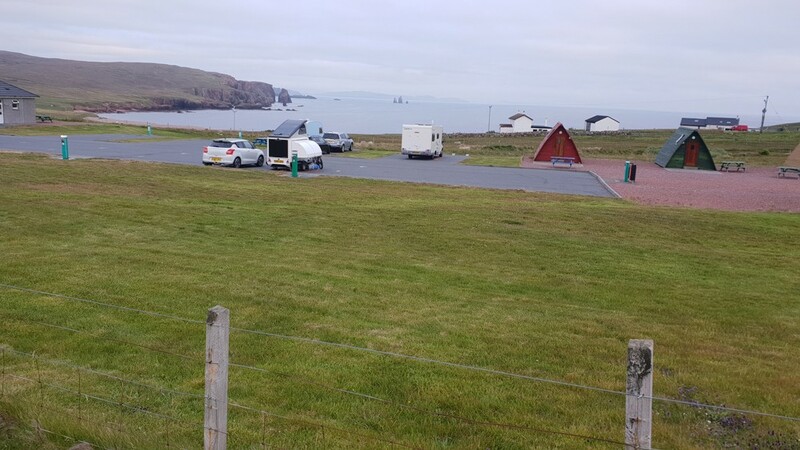 Camped on youth-hostel run site at Unst, virtually on the beach. "The Final Checkout" and indeed it was! I arrived after closing time at the cafe, but helpful lady made me a cup of tea and cake all the same! Shetlanders, it's just in their DNA, I reckon. 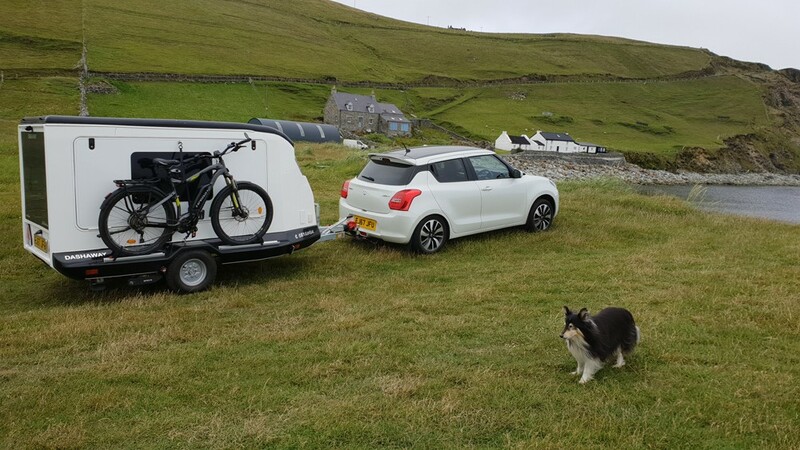 Unst: The most northerly cottage, car, Dashaway, e bike and Sheltie in the U.K! 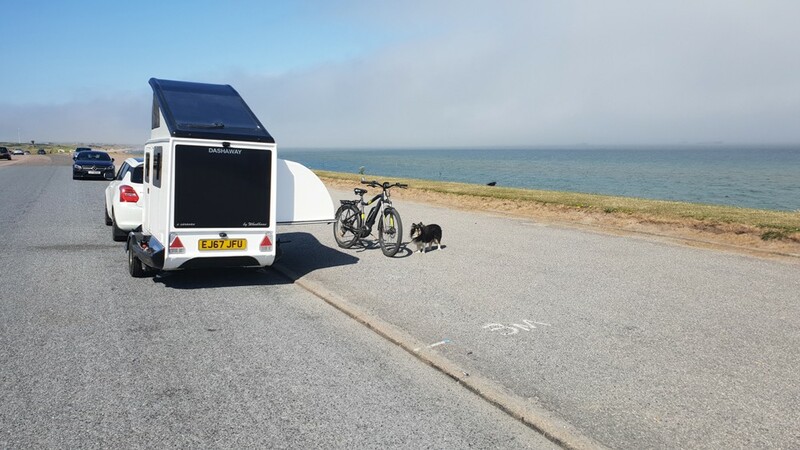 Wild camping means no campsite, so no facilities and no hook up. You need to be fully self sufficient. Well, that's OK then! Literally miles from anywhere! Totally self sufficient. Hardwick campsite and a decent cafe. 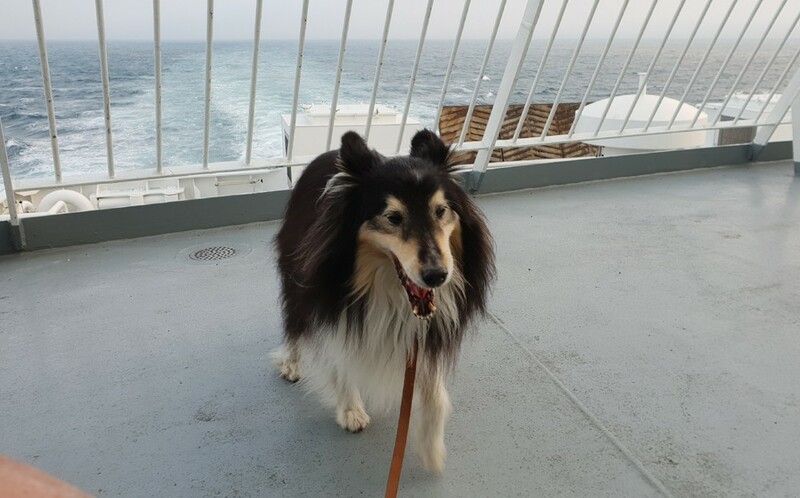 Shetland sheepdog Tara attracted great attention from cruise ship visitors, and the crew were filming for promotional purposes. It was rather ironic that Tara had come up from Essex though! 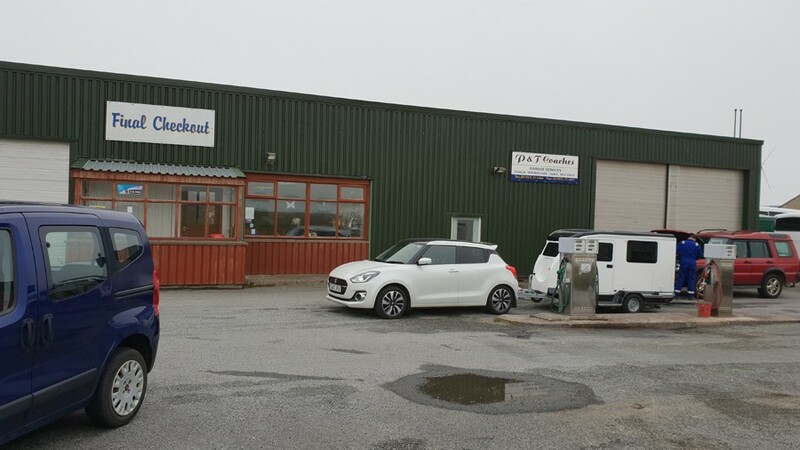 Cafes/tearooms are few and far between on Shetland. 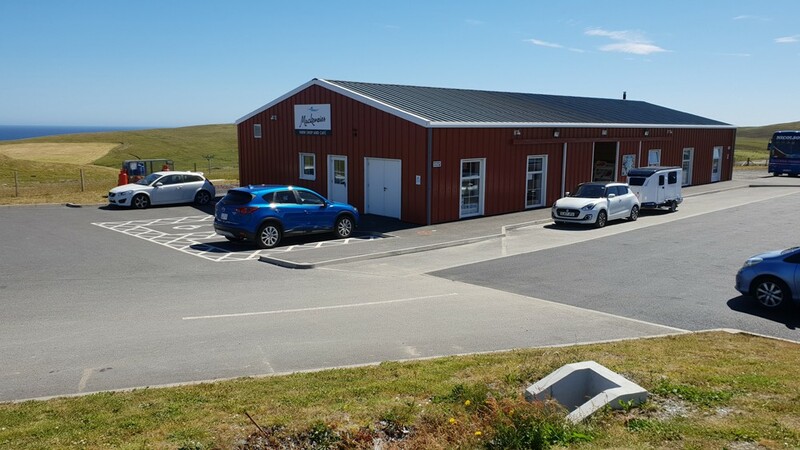 When you do find one, it may well be a "pop up" that's a primary school in term time and run by local volunteers, typifying the community spirit that runs through the veins of these islander folk. 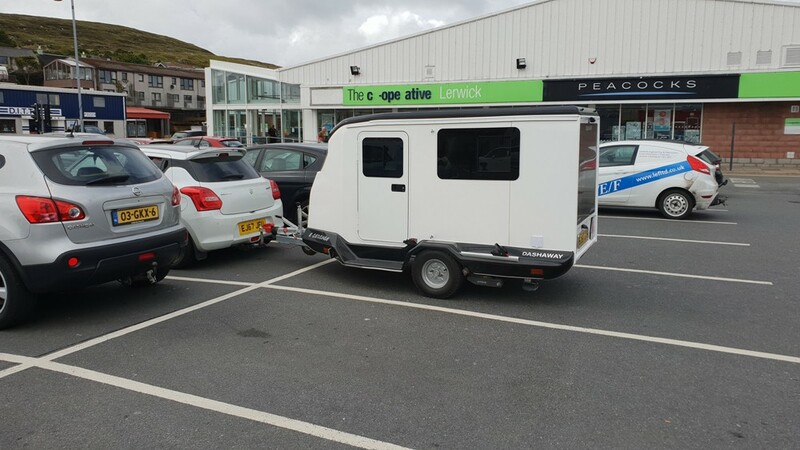 I came across an example of this on the island of Bressay, where I reversed the outfit into a parking slot, on the playground. Aided greatly by the rear view camera. 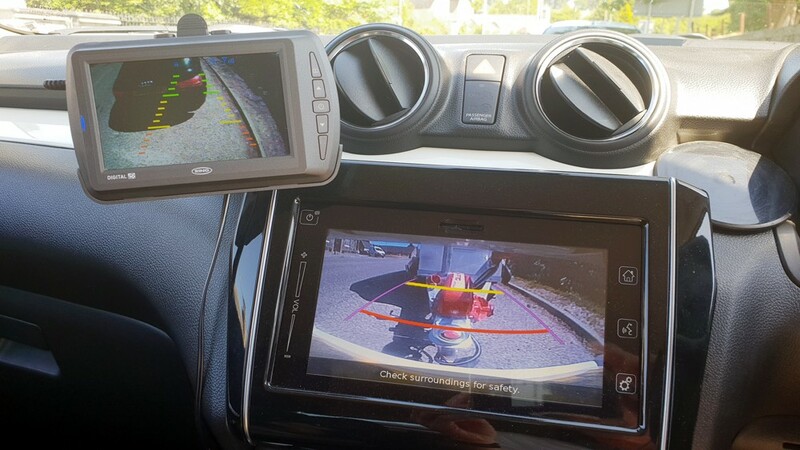 Rear view camera is hugely beneficial and gives peace of mind when "backing up". Gaping mouth of MV Hjaltland (at Lerwick) ready to swallow all of it's cargo! 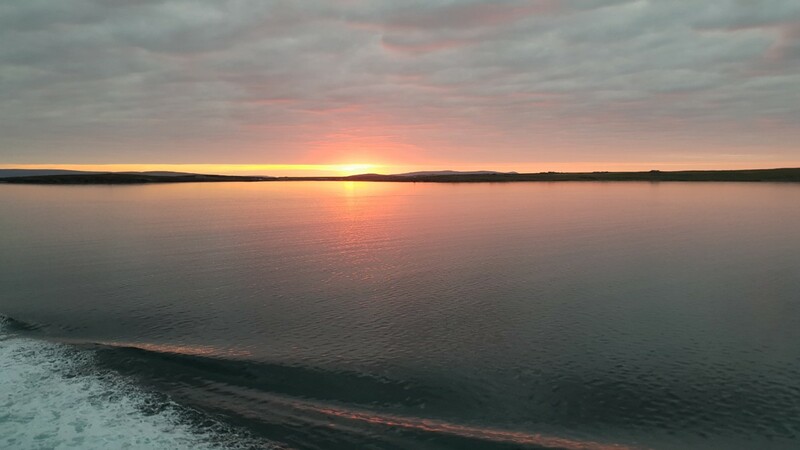 Orkney, from MV Hjaltland at about 11pm. Simply stunning. What a treat! Beautiful Perthshire on way back from Aberdeen.